We recommend that the bearing load be calculated by the specific surface pressure. 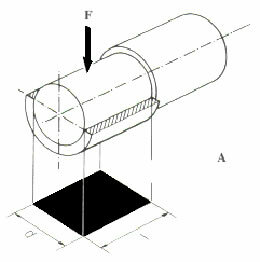 The projecting bearing surface is measured as illustrated. The dynamic and static pressures as indicated are valid only if the d/I ratio is between 0.6 and 1.2. For example, if d is 1 1/2 and I is 2 the d/I ratio is 0.75. Where longer bushings and shafts are used, consideration must be given to deflection and edge pressure. Under these condition, the load values would be lower. CONNEX Spring Bushings, manufactured from AISI 6150, are processed in a vibratory finisher after being heat treated to remove any burrs resulting from machining. They are then dipped into a proprietary rust preventative for surface protection.